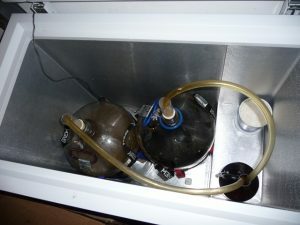 I started brewing beer at home in 2009 and over the course of the past several years, I have become an avid homebrewer. I brew numerous styles of beer, cider, mead, and wine. As an electrical engineer, I enjoy designing and building gadgets, so I have designed quite a few brewing gadgets including an electric brew system. After brewing all-grain for a while, I decided that I wanted to step up to 10 gallon batches, so that I could split batches with different yeast or treatments, or just have more of beers I like a lot. However, at that point I did not have anywhere to brew outdoors and the kitchen stove wasn’t going to cut it, even with a heat stick. To solve this problem, I decided to design and build an electric brew system that could run on 110V power, since I didn’t have any available 220V lines. I have been very happy with this system and continue to use it at my house where I do not have the same constraints. I use a custom-made digitally controlled homebrew system that also doubles as my cheesemaking system. 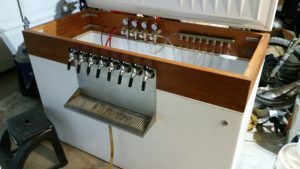 It consists of a 15.5 gallon heated hot liquor tank and brew kettle made from a converted sanke keg, a cooler as a mash tun, 2 March pumps, and a digital control box. The brew kettle / HLT has 2 electric water heater elements mounted into it, providing a combined 3650 watts of heating power. For transfers and recirculation, it has a stainless ball valve with camlock quick disconnects and a dip tube. A false bottom catches hops and break material. A RTD thermocouple is mounted into the pot as part of the temperature control system. A thermometer and sight glass are included for convenience. The control system is a custom-designed PID control box that I designed and built, which controls 2 separate 20A 110V circuits to power the heating elements. An Auber auto-tuning PID is used to control the temperature by duty-cycling power to the heating elements in the brewpot based on the reading from the RTD probe. A switched auxiliary outlet is provided on the control box for easy control of the March pumps and any other accessories. The brew kettle doubles as the hot liquor tank. Initially, strike water is heated to the correct temperature by dialing it into the controller. Once the mash is started, sparge water is heated in the hot liquor tank. The first runnings are taken into a separate brewpot and set aside. After the sparge water is added, the hot liquor tank becomes the boil kettle and the second runnings are taken directly into it. The first runnings are then poured into the main brewpot for the boil. Boil intensity can be controlled by adjusting the duty cycle on the digital controller. When I need to perform temperature steps as part of the mash, I can run the system as HERMS (Heat Exchanger Recirculating Mash System). Wort from the mash is recirculated via a March pump through a copper heat excahnger coil in the hot liquor tank. By controlling the hot liquor tank temperature and pump flow rates, I can control the temperature of the mash. Fermentation is controlled in chest freezers using digital temperature controllers. The chest freezers provide cooling and small heat pads warm when necessary. 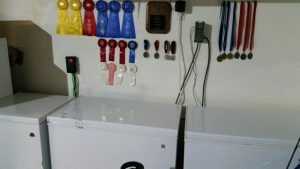 The main serving kegerator is a converted chest freezer that fits 14 kegs. It has 8 taps through the front (additional beers are served on picnic taps) and 5 different serving pressures. I also have a 2-tap kegerator built into my outside bar.